Gary: Tank Commander will hit the stage at the Glasgow SSE Hydro for three live shows in October! Two years after going AWOL from our screens Gary will hit the stage in Glasgow at the SSE Hydro for a series of live shows from the 20th until the 22nd of October 2016. This mission is set to be his biggest and most dangerous to date. The new show, called Mission Quite Possible, is likely to channel the United Nations meets Eurovision – an all fighting, all singing, (mibbe) all dancing (mibbe) extravaganza. 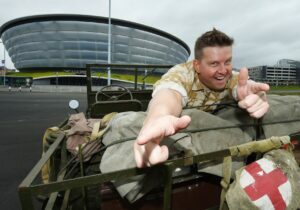 The live show in Glasgow follows three BBC TV series detailing the escapades of unlikely military man Gary and his crew.Gary Tank Commander’s live show will follow in the footsteps of Still Game, Kevin Bridges and Diversity performing at the 13,000-seat arena. The BAFTA winning sitcom, and BBC1 Scotland favorite written and created by Greg McHugh, has been a smash on TV and DVD and now is set to ‘kick oaff’ on the live stage. Having previously sought a replacement cooker for Gary’s dad, lost a tank in the line of duty and fought a personal battle with a vending machine for a Curly Wurly – Gary Tank Commander: Live – Mission Quite Possible will take things to another level! This fun loving, confident, very confident, amazingly confident soldier has a story to tell and it’s ALL going to be LIVE in front of your very eyes. I love it when a plan comes ‘the gither’. Tickets go on sale on Wednesday 24th June at 9am for Gary: Tank Commander Mission Quite Impossible at the SSE Hydro in Glasgow.